Communicating complex or highly technical information to a jury can be a challenge. Studies have shown that “visual learning mechanisms, rather than auditory learning mechanisms, produces greater learning and memory recall.” So why not consider adding 3D printing to your visual communication tool box? Imagine being able to physically place a highly precise, scale replica of almost any item into the hands of the jury. With the advances in 3D printing and laser scanning you are able to do just that. Items that were once too large and cumbersome to be submitted into court as demonstrative exhibits can now be 3D printed as smaller scale replicas. Complex highly technical products can be made into 3D models that can be seen from any angle. Even CT scans of a patient’s injuries can be 3D printed. The possible applications for 3D printing are nearly endless. Stereolithography 3D printing is an additive process that relies on photopolymerization to convert liquid materials into a 3D solid using an ultraviolet (UV) light. The 3D printing process begins with a three-dimensional model on a computer. 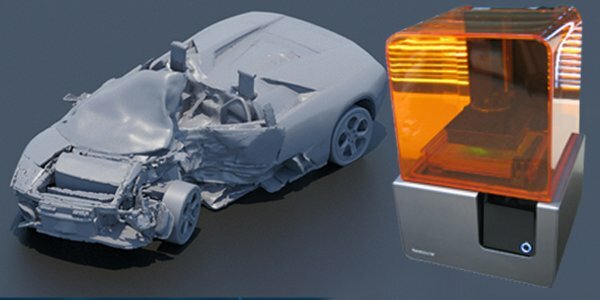 This 3D model can be derived from a laser scan, CT scan or 3D modeled by hand in a software package such as AutoCAD, 3DsMax, Maya, Sketchup, Zbrush or Blender. In the case of the 3D prints of the V-1 Lamborghini below, our team used two different techniques to create the final 3D prints. The exemplar model was modeled by hand in 3DsMax to the correct specifications of a V-1 Lamborghini. 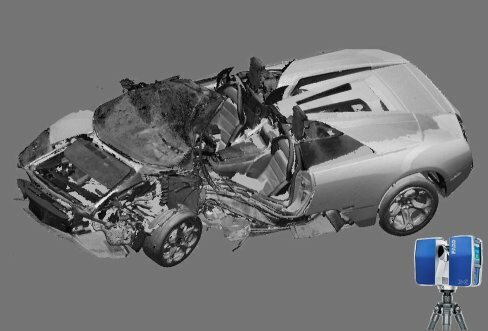 The subject vehicle was derived from a laser scan. The laser scanner uses lidar to collect millions of data points. With each pass of the laser, the scanner bounces invisible beams of light (905 nm wavelength) off the surface of the object being scanned. When the beams of light return to the scanner, it records the x,y,z coordinate information for each laser point and translates the data into a point cloud that can be displayed in 3D space on a computer. This point cloud can then be converted into a 3D mesh, processed and prepared for 3D printing. Preparing a 3D model for 3D printing is a relatively simple and straightforward process. We begin by making sure that the 3D print does not have any holes or five sided polygons. We then import our 3D mesh into PreForm (A software package that interfaces directly with our FormLabs, Form 2 3D printer). 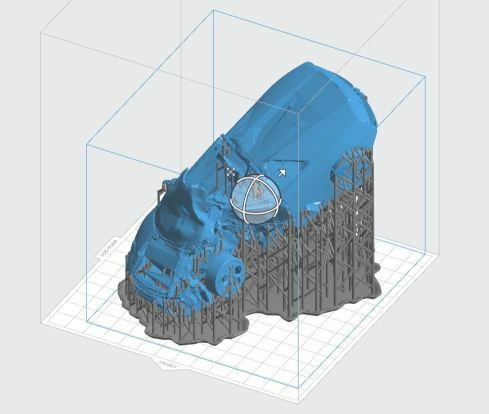 In PreForm we are able to automatically generate supports which are required for the 3D printing process. We are also able to view each layer of the print and orient the print in 3D space for optimal printing. Once done, we can send the 3D print to the 3D printer. When the “Print” button is pressed on the printer, the build platform dips into the liquid resin and the UV laser draws the 3D Model on the surface of a build platform. With each pass of the laser the UV light causes the molecules in the resin to link together and photochemically solidify into a three-dimensional solid. Each layer can be as thin as 25 microns and as a result a 3D print can be made up of hundreds or thousands of layers and can take several hours or days to finish printing. Once the 3D print is finished, the print is removed from the 3D printer and detached from the build platform. It is then soaked in a bath of 90 proof isopropyl alcohol. The alcohol removes any of the excess liquid resin left clinging to the 3D print. The supports are then clipped away and the attachment points for the supports are lightly sanded to reveal the final 3D print. If you would like to find out more about the 3D printing process and the 3D printing services Ponderosa Associates provides please contact us. We are also happy to provide you with a free quote so you can decide if 3D printing is right for you and your client. Lindner, Katie; Blosser, Greta; and Cunigan, Kris (2009) "Visual versus auditory learning and memory recall performance on shortterm versus long-term tests," Modern Psychological Studies: Vol. 15 : No. 1 , Article 6.